Georgia boasts a diverse landscape. 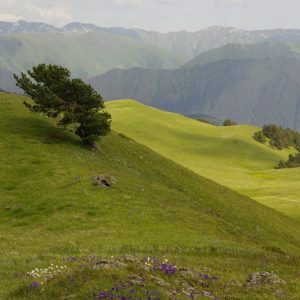 You can find high peaks of the Caucasus, a desert, colorful hills in Kakheti, gorgeous lakes, and medieval defense towers in rural regions to name a few. 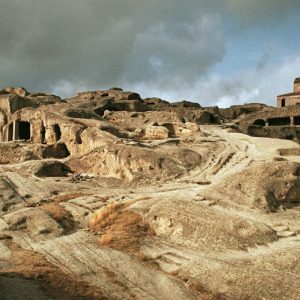 It also boasts with ancient cave towns – Vardzia, Uplistsikhe, and David Gareji. They are different from each other, both with the construction and the period it was built. 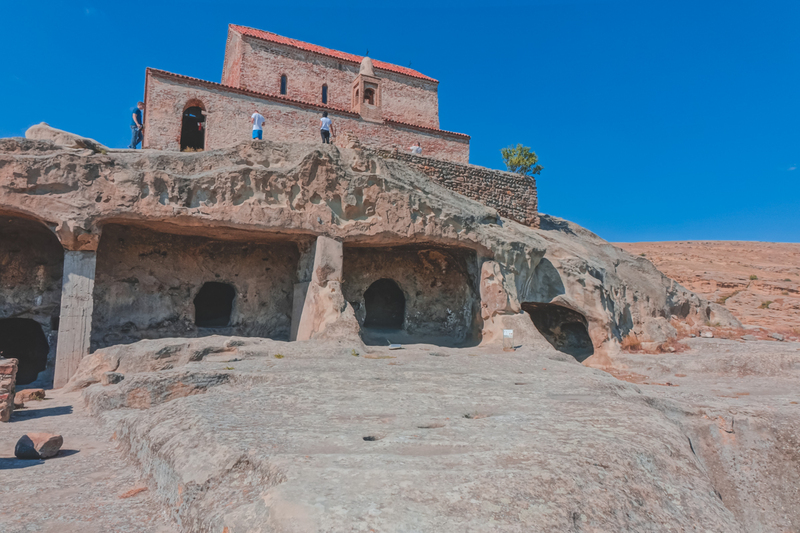 In this post, we’ll discover the oldest one – Uplistsikhe. 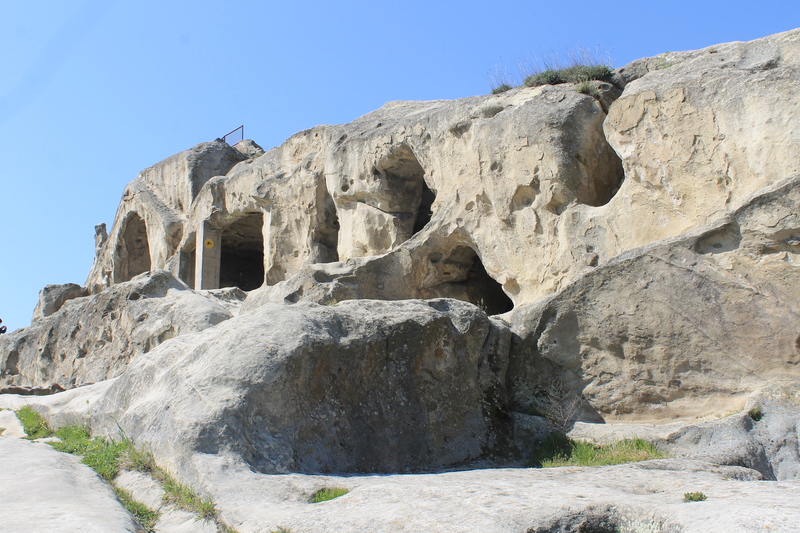 An ancient cave city that makes a great day tour from Tbilisi. 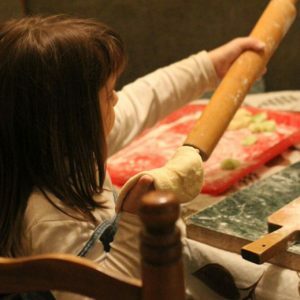 What makes Uplistsikhe so special? Occupying 10 ha of land, it is the only remaining landmark in Georgia, which dates back to the Classical antiquity period. Located in Shida Kartli, around 9 km from the town of Gori, the area was a functioning town. It had streets, squares, irrigation pipes, various buildings, four gates, a secret tunnel to the Mtkvari river, and a defensive wall. Today, it serves as an open-air museum everyone can visit. The legend has it that slaves built Uplistsikhe. They used metal pickaxes to curve the town. Underneath that metal was gold. They had to wear out the metal to get the gold and freedom. According to the archaeological excavations and items found here, the town was inhabited during 16th-15th centuries BC. From the 4th century BC to 3rd century AD, Upliststikhe was a religious and administrative center of Kartli. But when Georgia adopted Christianity in the 4th century, the settlement in Uplistsikhe decreased. Thus, it still remained as a well-fortified castle. The proximity to the main trade route of Georgia resulted in many invasions both from local kings and foreign nations. Conquering the town, meant ruling over the Kartli region. In the 10th-13th centuries, Uplistsikhe was again restored into a town and the population equaled to almost 20,000 citizens. 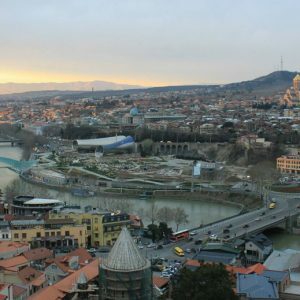 When Tbilisi became the capital of Georgia once again, the number of inhabitants reduced again. During the Mongol invasions in the 13th-14th centuries, Uplistsikhe was completely abandoned. Afterward, it was occasionally used as a shelter during other attacks in the country. When visiting Uplistsikhe with Taste Georgia, you can wander through those ancient streets and buildings, imagining how life used to be back in the day. 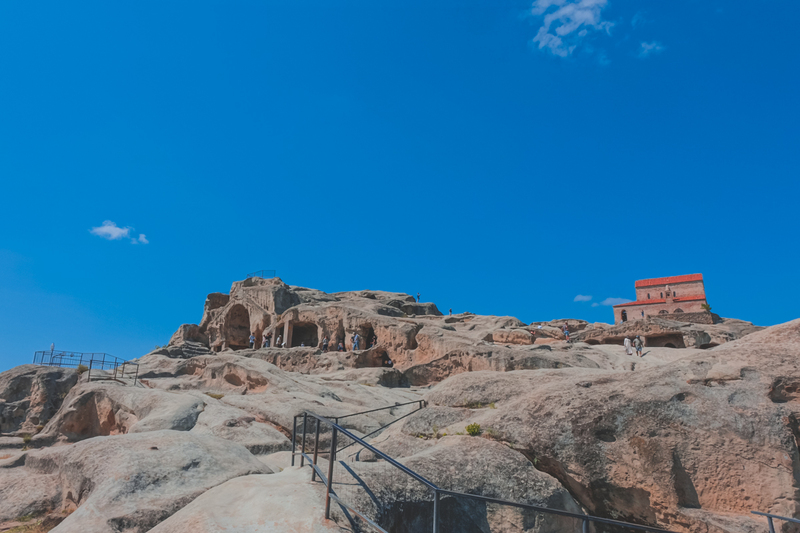 You can visit the rock-hewn halls, theater dating back to the 2nd century, the 6th-century basilica carved into the rock, and many more. You can also walk through a small part of the 41-meter long secret tunnel, used during the invasions to supply it with water and food. Outside of the church, you’ll notice so-called sacrificed qvevries. When a child was born in the family, they stored wine in qvevri until he/she reached the age of 16. Then, the family would bring it to the church and leave right there. How to get to Uplistsikhe: Taste Georgia arranges day trips to Uplistsikhe that include the Stalin Museum in Gori. If you are traveling on your own and planning on using public transport, then you’ll first need to get to the town of Gori. Minibuses, marshrutkas, run daily every half an hour from Didube Bus Station. The journey takes around one hour. Then, you’ll need to take another marshrutka towards Kvakhvreli village. Tell the driver to drop you off at the road leading to Uplistsikhe. From here, you’ll need to walk around 2 km to get to the box office and entrance of the museum. 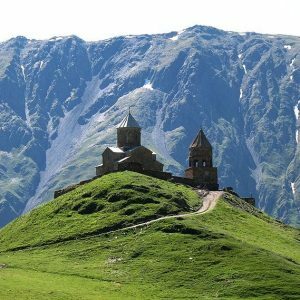 You can easily do everything in a day, making Uplistsikhe a great day trip destination from Tbilisi.